Volunteers can be involved in our programs in a variety of ways, including team-teaching money management classes, working with small groups, or assisting with an array of tasks, such as marketing, grant writing, data entry, and staffing special events. 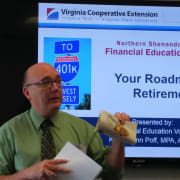 Master Financial Education Volunteers receive training on topics such as personal finance foundations, credit, spending and savings plans, banking, predatory lending, insurance, recordkeeping, getting out of debt and more. Volunteers then participate in offering a variety of financial education opportunities for people of all ages from all walks of life. A detailed description of the specific programs our volunteers serve in can be found on our website at: https://warren.ext.vt.edu/programs/nsvfep/volunteer.html. The time commitment varies based on the specific role; however, we ask for a minimum of 50 hours in return for the extensive training. The training is 30 hours (9 sessions, three hours each, plus some very applicable relevant "homework" (not "busywork")). We ask for at least 50 hours of volunteer time in return following the training. The cost for the training is $20.